As some of you may know from my previous post, I recently moved to London to join the Blogosphere team and this week we launched our latest issue. This is such a special issue for me! Although I've been writing for the magazine since the beginning and became even more involved when I redesigned the website in November, this was the very first issue that I was as an official member of the Blogosphere team. I wanted to share some photos from the night and chat a little bit about the magazine as I've really only mentioned it before over on my design blog, XOMISSE. Blogosphere Magazine is an internationally distributed publication that launched in Autumn 2013 and covers a whole range of interesting topics for the blogging and social media community. Each issue is split into eight main sections: beauty, fashion, food, travel, lifestyle, photography, parenting and arts & crafts. A blogger is chosen for each section and they recommend five of their favorite bloggers to feature. So you get all the best bits from the blogosphere! There's also exclusive features and interviews as well as a social media section, an agony aunt section answering all of your blogging questions and other blogging tips. Issue 9 is just packed full of amazing content so I won't go into detail here but I wanted to share some of the articles I most enjoyed reading. There's something so calming and empowering about cover star Ella Grace Denton and her interview was truly inspiring. I got to speak to her at the event and she's just lovely. There's also an interview with Emma Gannon and Q&A with Hannah Gale - two amazing women who are killing it online! I found the article on Journalists vs Bloggers really interesting and Jess from CopperGarden's fashion section made me want to go shopping! I also really enjoyed what Aftab wrote about life as a student blogger, I related to a lot of it and his motivation really inspired me. And finally I have to mention my own section - I share some SEO tips and talk about using Periscope as a blogger to grow and connect with your readers. In addition to the 164 pages of great content there's also a brand new events supplement reviewing meet-ups, classes and other events from around the UK. It's a fabulous guide to blogger events, Albertine did such a good job with it. On Wednesday we hosted a party at 15 Bateman Street in Soho to reveal who our cover star was. Magazine editors, contributers and platinum subscribers were invited along to celebrate the latest issue with us. It was an absolutely crazy day but six o'clock quickly arrived and we were all ready to start the evening. Hannah Trigwell performed on the night as people started to arrive. She is so talented! At around 7.30pm Alice, Editor-in-Chief, thanked everyone for coming and announced the cover star who was in the room. Then it was time to enjoy the evening - chat to everyone, check out the showcase stalls and try some Premier Estates Prosecco and Fentimans Rose Lemonade! My favourite part of the Cover Reveal party was being able to meet everyone in person. Since being in London I've helped design and proof each page of Issue 9 so getting to actually put a face and voice to each blogger was amazing! I also got to meet some lovely bloggers who told me that they have read XOMISSE for years, which made me extremely happy. And when people like Jess, owner of the F.B.L Bloggers community, tells you that your blog is their "blog bible"... well that's a pretty amazing and humbling feeling. Albertine did such a great job organising the night. I had an amazing time, and I hope that everyone who attended did too! If you've got your hands on an Issue 9 let me know what you think. We've already started planning Issue 10...exciting! 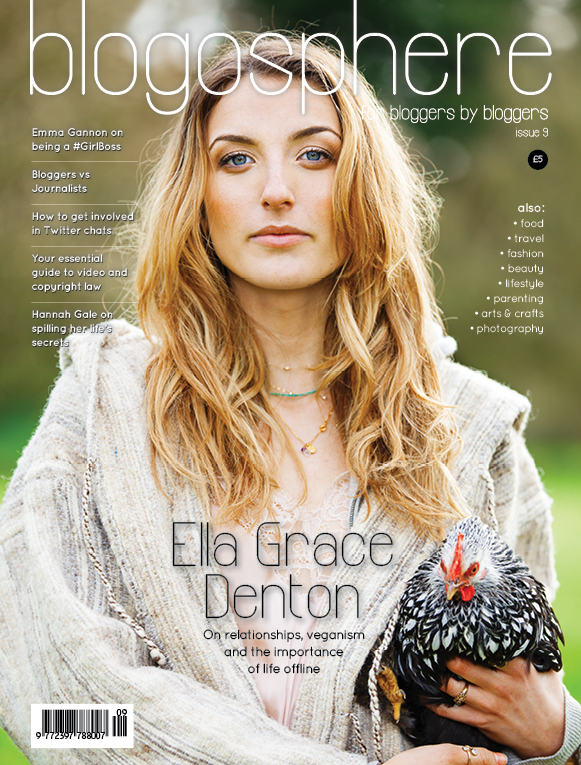 Where to buy Blogosphere Magazine? For those of you interested in getting your hands on a copy of the magazine, it's available in a number of WHSmith and independent stores around the UK (see stockist list here). It's also available online before it hits the shelves - we ship internationally. Although if you want to gaurantee your issue then check out the subscription packages to get the latest issue sent straight to your door as soon as it launches (subscriptions also come with lots of amazing perks). PS. There's a giveaway over on our Twitter and Facebook page to win a goody bag, go quick! !